During the consultation, James will be gathering dietary history and general information from the client to gain an understanding of their current nutritional state. Two weeks after the initial consultation, we will arrange another session where James will present the custom-designed meal plan he will have created for the client to follow. A month down the track the client’s plan and health will be reassessed and further adjustments will be made if needed. James Hart is very passionate about helping others achieve their nutritional goals. James has first-hand experience of dietary problems, having dealt with severe Crohn’s Disease from the age of eighteen … in just three years, he achieved remission. At age twenty one he is now medication free due to his nutrition and lifestyle choices. This experience has motivated James to broaden his horizons by studying courses to provide him with the knowledge to help others. 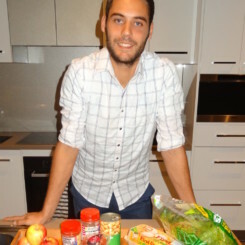 James is qualified in certificate II in Human Nutrition and Certificate IV in Dietetics, and is currently studying a Bachelors Degree in Human Nutrition at Flinders University.